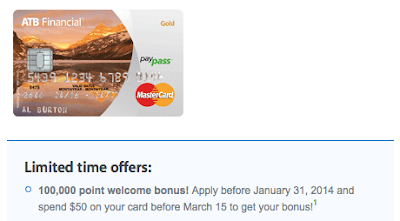 Rewards Canada: ATB Gold My Rewards Travel MasterCard 100,000 Point Sign Up Bonus - Classic case of "Remember people it's all about the EARN and the BURN"
The other day when I was driving home I heard an ad on the radio for the ATB Gold My Rewards Travel MasterCard. What caught my attention was the offer of 100,000 bonus points if you spend $50 on the card by January 31st! Whoa I thought as no card in Canada has offered a 100,000 point sign up bonus before and it reminded me of the immensely popular British Airways 100,000 Avios card offer south of the border. Now I'll admit it's been awhile since I last looked at all the details of this card and could not recall the value of those points. So I decided I would be like many radio listeners and take the approach that I don't know much about the ins and outs of rewards programs and think wow 100,000 points that must be amazing and also think that it is like most other programs in that 100,000 points will get you a big travel rears reward! I mean if it was equal to Aeroplan or British Airways that would be enough miles for a business class ticket to Europe or multiple economy class tickets within North America. Even other programs like Amex's Membership Rewards that 100,000 would be worth 1$,000 in travel if you don't convert to their airline partners. When I got home I looked up the details on the card to refresh my knowledge of it. Guess what I learned once again and I hope that most people will do the same before jumping on this offer? That 100,000 points is worth a whopping $100! That's right $100 of travel credit. This is a classic case of some sly marketing at work in the hope that you won't examine the burn side of the program and simply apply for the card thinking the 100,000 point bonus is huge. It's not. So just like our post earlier in the year trying to educate Canadians about looking at both sides of a program, I want to stress to you Remember People it's all about the Earn AND the Burn!